With Batman: The Brave and the Bold the hottest thing since... well the last cartoon that featured Batman, it only makes sense that the powers that be are already planning 'what's next'. Today those 'best laid plans' rumoured to be revealed at Comic Con, hit a speed bump, with two 'voices' letting slip on an upcoming Young Justice League. As mentioned on TitansTower, the rumours started on an external chat forum, where a poster claimed they had seen a teaser sheet, featuring Martian Girl, Aqualad, Nightwing, Impulse, Arrowette, and Connor Kent, with the Justice League standing in the distance behind them. 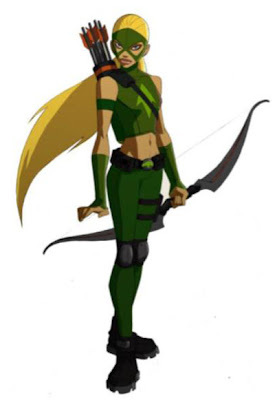 Then just as the speculation was about to land in the 'wait and see' pile, actress Stephanie Lemelin excitedly jumped the gun, blogging that her dream of being cast in a Saturday morning cartoon had come true, having landed the role of Arrowette (as well as several support cast members), in the new animated series "Young Justice League". To polish the news off, she then posted the above pic of her newly crowned "ridiculously hot avatar". With that post since deleted, Twitter user TdashRICH has picked up the baton, posting an image of 'Aqualad' - the part of whom he claims he read for earlier that night - drawn in a similar style to Stephanie's pic of the junior Ms. Green Arrow.